One concern I hear over and over from marketing managers and executives is about accurately and objectively measuring SEO progress and ROI. The team members in the trenches are monitoring rankings, bounce rates, engagement, etc., but eventually, you have to know what’s actually driving revenue—and the C-suite wants numbers to prove it. But modern SEO hasn’t been the easiest thing to confine to a static set of metrics. Traditionally, SEO efforts that could rely on more technical strategies were easier to measure. Today, effective SEO is much less technical, so we need to adapt our methods. While search engines are always improving (which means that your content must always be improving), they’re always focused on the same end goal, which means good, modern SEO really is a long-term strategy. How do you measure your efforts for improvements and what do you show the C-suite in the meantime? Search results are personalized. Google considers factors like browsing history, physical location, demographics, and personal preferences when dishing up search results. When you Google your key terms, you are probably not seeing the same results that your target audience is seeing when they search those same words. All keywords are not created equal. Reporting that your brand now ranks on page 1 for six of your top 10 keywords can be a good excuse to buy the marketing team lunch on Friday, but that’s about it. The importance of each individual keyword depends on search volume and its relevance to your business. Resources should be focused on the keywords that actually impact the bottom line. Ranking changes are not measured by a universal standard. If I told you that your brand dropped eight places for one of your keywords and two places for another, which would be more important to address? The answer: you don’t know yet. Dropping eight places on page 4 of search results isn’t going to impact your organic traffic, but dropping two places on page 1 probably will. The truth is, effective SEO—the work that drives real, lasting ranking changes and leads to increased revenue—is long-term work. Marketers that make a daily habit of checking their rankings tend to fall into reactive, instead of proactive, SEO habits. Most ranking changes don’t require immediate SEO attention. Search engines are always testing new algorithms, and competitors are always publishing new content. SEO that is constantly responding to ranking changes misuses resources that should be spent on the real job of building influence. And SEO reports that over-emphasize keyword rankings tend to lead executives astray on the health of their SEO efforts. If you must Google, at least use a depersonalized search to strip (most of) the personalization out of your search results. If you are using another SEO tool to monitor ranking, choose one and stick with it. Every tool uses a slightly different process to determine your “real” ranking, so stay consistent with one tool to get results you can use. As you monitor rankings and track changes, remember to look at the big picture. Resist the temptation to scramble after every tiny ranking change by creating one report that looks at high-value keywords and a separate one for low-value keywords, so you can more easily focus on the keywords that actually drive conversions. Similarly, be sure to note the page and/or position numbers of rankings that change so you can emphasize smaller changes on page one over big changes on page four. Search traffic is the real goal behind improving search engine rankings, so a greater emphasis should be put on your efforts here. Any improvement in keyword ranking could be the result of a standard search engine fluctuation, but increases in organic traffic are concrete evidence that SEO work is paying off. 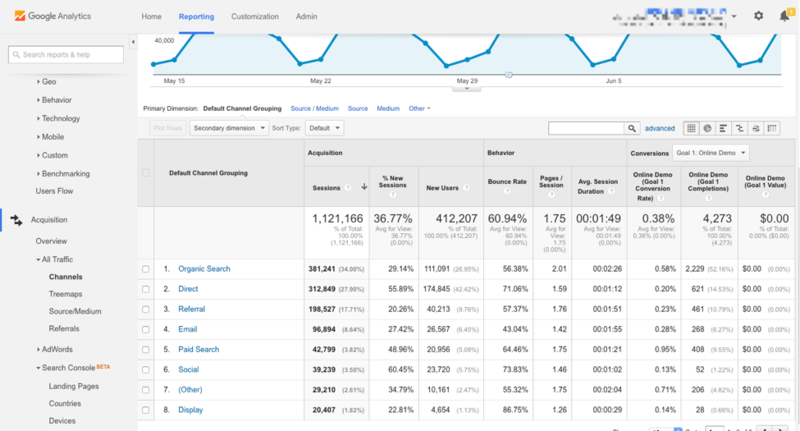 First, make sure you are set up with Google Analytics. It’s a free tool, with a Premium feature that is priced for enterprise-level organizations. The Premium version mostly offers greater support and service, and more specific numbers—whereas the free version “samples” data to provide more rounded numbers. The data you get, however, is enough for your purposes here. Ever since Google took away keyword data, it’s incredibly difficult to break organic traffic data into branded and non-branded categories (although there are some great tools that can help). The best way, within Google Analytics, is to click into Organic Search from the first column in the above table, and then select Landing Page from the Secondary Dimension drop-down option above the table. The keywords are, surprise, “(not provided),” but we can gather some clues from the landing pages they point to. 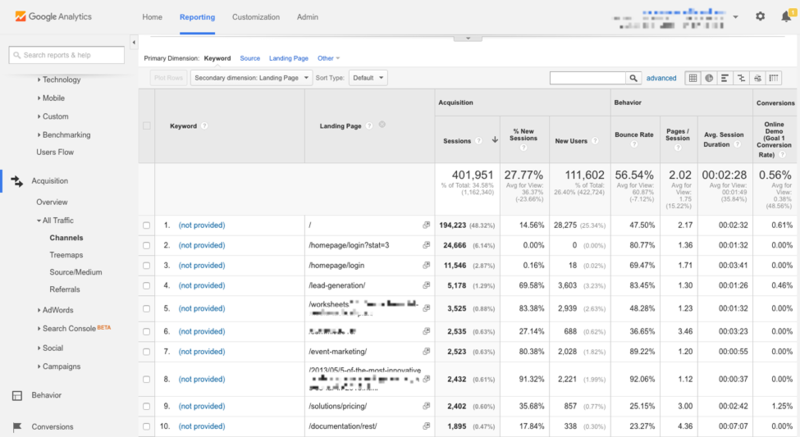 For home pages and login pages (rows 1-3 above), we can assume most of that traffic came from branded searches because there is no keyword focus for those pages other than the brand name. Traffic to blog posts and resource content (rows 4-8 above) probably mostly came from non-branded search traffic because they focus on a solution or on information that Google would have delivered in result to a more generic query. Rough estimates to be sure, but we’re at Google’s mercy concerning what data they choose to share. The goal of high search rankings is traffic, but the goal of traffic—to push the process all the way to the bottom line—is sales. Every website visitor does not convert to sales, so it’s important to monitor the conversion rate of your SEO efforts. Every conversion point, which will vary based on your industry and business model, should be considered: from ebook downloads to online purchases. 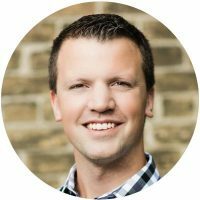 Multi-touch attribution also needs to be considered, since every visit won’t convert—but every visit may lead to a conversion later. Goal templates: These templates are organized by categories (revenue, acquisition, inquiry, and engagement). If your account is associated with a specific industry in Google, you will also see templates for specific industries. Every template can be edited. Custom goals If you prefer, you can create a custom goal from scratch. You just need to decide whether you want to create a goal based on which pages the user views, how long the user stays on a page, how a user interacts with your site, or how many pages a user views per session. Smart goals: If you’re using Google AdWords, you can take advantage of their machine learning programs to create smart goals. Turning on smart goals allows the program to monitor website visits, track which become conversions, use those insights to score visits, and automatically translate the best ones into goals. Your goals then become those actions that usually lead to conversions, and Analytics monitors them for you. Goal completions from organic traffic can tie SEO efforts back into the revenue stream. When you start using modern SEO strategies to drive traffic to a specific landing page (one with a good conversion rate), you can watch the views and time on that page increase. I like metrics. Ask any of my staff: when we launch a new campaign, I put the Google Analytics Real-Time view on the flatscreen TV in our office. I like to gather data and try to extrapolate what it all means, but the truth is that most of what are commonly considered “SEO metrics” don’t mean anything to a brand’s bottom line. These three metrics—keyword ranking (with huge caveats), traffic from organic search, and conversions/ROI from organic search—can give you the insights you need to drive improvement and growth in your SEO strategy. They will also give you meaningful numbers to report to the C-suite, because they are rooted in a modern understanding of SEO.